The Chi Chi Rodriguez driving range had sustained severe damage from Hurricane Irma and had yet to be repaired. The lighting that was being provided after the hurricane damage was not adequate, and caused a safety hazard for the members and customers that used the driving range facility. The original lighting poles did not need replacing, but the normal wear and tear of the lamps and ballasts meant that they needed to be replaced in order to allow members use the driving range facilities after the sun went down. High winds and lightning strikes are very hard on metal halide lamps and ballasts. We replaced them with brand new metal halide lamps. Metal halide lamps are used in this project because they have a high luminous efficacy of over 75 lumens per watt, and have 6,000 -15000 hours lifespan. Metal halide lamps are used for large area overhead lighting, which is perfect for a driving range. Our Bucket Truck was used to replace the old metal halide lamps and ballasts. While conducting this project we noticed that there were some areas where the wiring was not properly grounded. Ground wires will send excess electricity towards the ground, so there is no chance of power surges, electric shocks, short circuits, and electrical fires occurring. So it was important to repair these areas immediately to lessen the likelihood of more damages being sustained to the driving range. The driving range was closed off for the time that we were working on it, between 02/01/18 – 02/03/18, however this did not coincide with their busier times, as minimal disruption was requested. Only 3 East-West Electric technicians were required for the job. The Chi Chi Rodriquez Golf Club is situated in Clearwater, Florida. It boasts a par-69 golf course expanded across 140 acre wooded upland. The course features more than 70 sand traps, water hazards in 12 holes, two-tiered greens, and fairways covered with Bermuda grass. 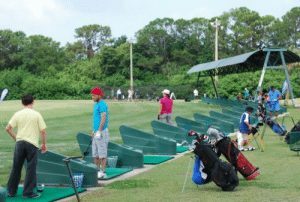 The Golf Course & Driving Range is located on the Chi Chi Rodriguez Academy Campus. All proceeds from the golf club go to support the Academy students, and the Golf Club is also used as living classrooms to provide the students with hands-on learning experiences. The driving range boasted 49 driving mats with two 100 foot awnings that allow you to practice in the shade. The entire range is lighted and boasts over 10,000 square feet of acreage to allow you to perfect your game even after the sun goes down. We are thankful that the Chi Chi Rodriguez Golf Club entrusted us with their commercial electrical project. As a proud member of the Pinellas County family, we at East-West Electric take pride in helping our fellow community members in moving on from the ordeal that hurricanes and major storms leave in their wake. If you are in need of an experienced electrical contractor for a commercial project, call us today on (727) 771-9403. You can also complete our online contact form. We will cater to all of your needs, from installing new lighting fixtures, conducting sports court lighting repair, upgrading electrical systems in commercial buildings, and installing clean energy systems to save you money.